Are you looking for a sports car that can handle your family? Do you need something that you can haul the kids and cargo around in without having to drive a minivan or a “Mom Car?” Why not check out the Dodge Challenger SXT? You may not think of the Challenger as a family car but you might be pleasantly surprise. The Dodge Challenger is an iconic car that people secretly and not so secretly long for. It is that car that people dream of, that someday day I will own that car. Granted, most people dream of that fantastic power and roar of the Hemi. They often over look the v6 model. Why is that? Does the fact that it has a v6 under the hood make the exterior of the car look any less attractive? No, it does not. It simply does not have the same power or roar that the Hemi models do. Now some people ask is it really a muscle car if it has a v6? Yes, it is still a muscle car! In 1971 the v8 Hemi Challenger equipped with the 383 only had 300 horsepower. The 0-60 time was 7 seconds. The 2015 Dodge Challenger SXT is equipped with the 3.6 VVT Pentastar that has 305 horsepower. The 0-60 time is 6 flat. The 2015 and up has the 8-speed TorqueFlite transmission. It improves the shift times, while also improving the gas mileage. The SXT gets 19 mpg in the city and 30 mpg on the highway. That is pretty impressive for a car that weighs 3,834 lbs. The Challenger SXT is a very aggressive looking car with great attention to details and style. The exterior has the retro look of the 1971 Dodge Challenger. It starts at the iconic look of the split grille and aggressive brow. The projector headlamps with quad LED halo surrounds and available projector fog lamps are sure to light up the night. This grille is distinctive from anything else on the road. On the rear of the car is the tail lights are tucked into a black bar. They are split in the middle with LED lighting. They are powerful and stylish. They are sure to be recognized by everyone on the road. The interior has been update with a more retro feel. The instrument panel has taken on the style of the classic 1971 Challenger paired with modern technology. It looks fantastic! It is equipped with a fully customizable 7-inch TFT center display screen. There is also the 8.4-inch touch screen Uconnect integrated access system. The entire cab is designed for the driver. Everything is laid out within reaching distance of the driver. It curves around the driver. My son said that it looks like a racecar on the inside. It has that perfect blend of a muscle car look paired with comfort and technology that makes it fun and exciting to drive. You might be surprised to learn that 2 adults or 3 children can comfortably sit in the backseat. I have climbed into the backseat of mine and I was very comfortable. A friend of mine actually has 2 car seats in the backseat of his Challenger. This is not your average “Dad Mobile.” It will have you looking like the coolest Dad in the school pick-up line. All of the other kids will be talking about your ride. I was impressed by the massive trunk area with the capability to fold down the rear seats to increase your cargo capacity. You will be amazed at how much stuff you can fit into the 16.2 cubic feet of trunk space. You have the option of getting the Super Track Pak. It consist of 20 x 8.0-in. cast aluminum Hyper Black II wheels, high-performance steering, P245/45ZR20 BSW Goodyear tires, anti-lock four-wheel disc high performance brakes, performance suspension, 3.07 rear-axle ratio and Dodge Performance Pages. Let’s just say it provides the ability to have a little more fun when the kids are not in the car with you. 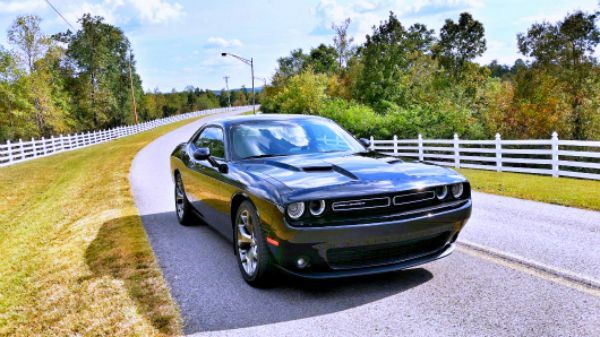 Overall, if you are looking for a stylish and fun family vehicle or something that has plenty of power with good gas mileage the Dodge Challenger SXT Plus is a great find! I know that for me personally I love driving this car. I do have the SXT Plus with the Super Track Pak. There is nothing that I love more than to climb behind the wheel of this beautiful car after a long day and just drive! It is one of the greatest stress relievers that I have ever found! It is so much fun! Also, I will say that the looks I get while driving it are rather fun too. I always enjoy peoples reactions to the car. I love it when little boys call it “The Race Car.” I couldn’t help but beam with joy as a 5 year old little girl got all excited my Challenger. Recently, a teenage girl spent 30 minutes taking photos of my car. She kept talking about how much she loved it. Whenever I stop at a gas station I am sure to find someone staring at my Challenger. Usually there is an older gentleman that will come up and ask me questions about it and share stories of his glory days. There are as many women that want to stop and talk to me about how cool my car is, as there are men. It is sure to get attention everywhere you go!